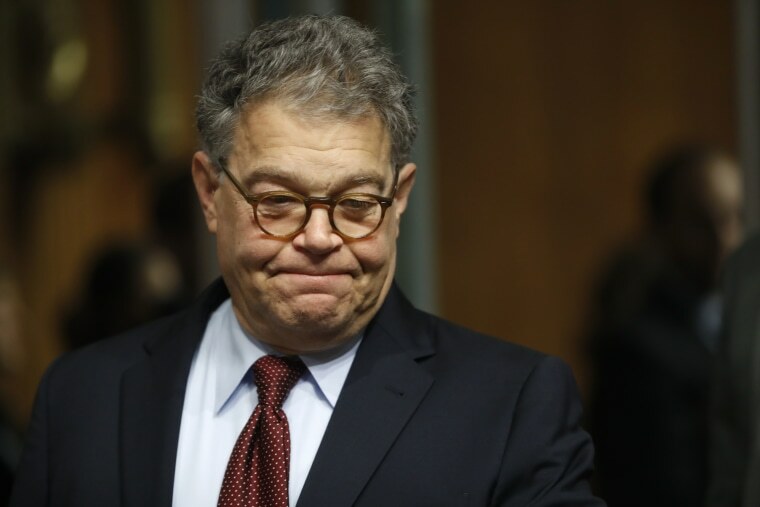 Sen. Al Franken apologized on Thursday after two more women accused him of making unwanted sexual contact, including groping or touching, and he pledged to work to regain the trust of his constituents. "I crossed a line for some women," Franken said in a statement, and "I feel terribly that I've made some women feel badly and for that I am so sorry." The latest apology came after two women, who were quoted anonymously, told the Huffington Post that Franken had touched them inappropriately on the buttocks; one said it occurred while they posed for a photo. NBC News has not verified the report. "I've met tens of thousands of people and taken thousands of photographs, often in crowded and chaotic situations. I'm a warm person; I hug people," Franken said. "I've learned from recent stories that in some of those encounters, I crossed a line for some women — and I know that any number is too many." "Some women have found my greetings or embraces for a hug or photo inappropriate, and I respect their feelings about that," Franken said. "I've thought a lot in recent days about how that could happen, and recognize that I need to be much more careful and sensitive in these situations." Two other women previously came forward to accuse Franken of unwanted contact. Last week, Leeann Tweeden, a Los Angeles radio news anchor, alleged that Franken forcibly kissed her after insisting they rehearse a scene in a skit, and that he groped her while she was asleep on a plane during a USO tour in 2006, before Franken was a senator. Lindsay Menz, 33, told CNN in an interview a few days later that Franken had grabbed her buttocks when they posed for a photo together in 2010, when Franken was a senator. Franken apologized to Tweeden and said he remembered the skit rehearsal differently. He said "there's no excuse" for the incident on the plane, that "it isn't funny" and "it's completely inappropriate." After Menz made her claims, Franken said in a statement to CNN that he didn’t remember taking the photo but said "I feel badly that Ms. Menz came away from our interaction feeling disrespected." Franken in Thursday's statement said "I feel terribly that I've made some women feel badly and for that I am so sorry, and I want to make sure that never happens again." "And let me say again to Minnesotans that I'm sorry for putting them through this and I'm committed to regaining their trust," Franken said.